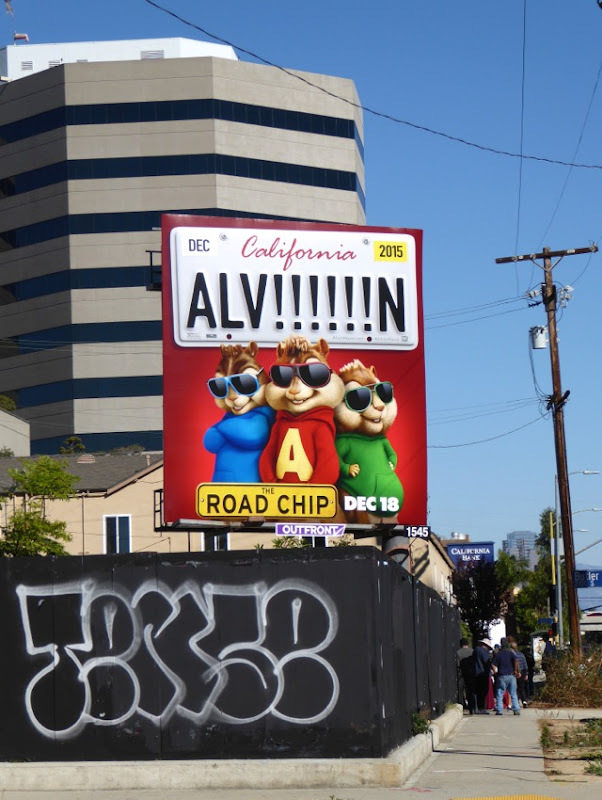 This holiday season Alvin and the Chipmunks are back for another live-action/computer-animated 'squeakquel' and before you protest in a high pitched voice that it's the same weekend as Star Wars: The Force Awakens opens, remember it's the kids that will want to watch it and not you. 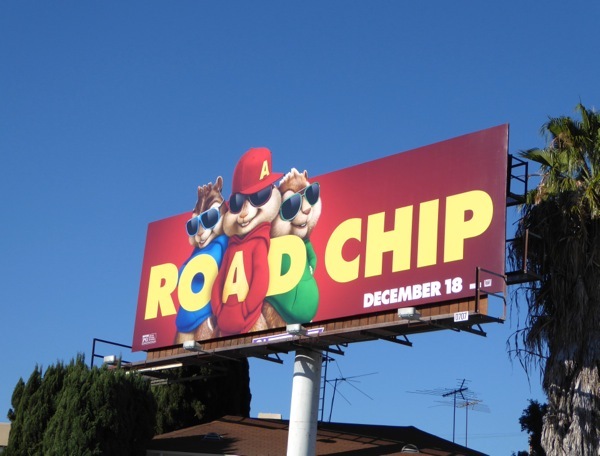 Yes, the 'little-big-screen-franchise-that-could' has taken on box office successes before like Avatar, I Am Legend Mission Impossible, Sherlock Holmes movies and more, so The Road Chip is sure to thrive alongside the new Star Wars installment and Tina Fey and Amy Poehler's Sisters comedy, which all target very different audiences. 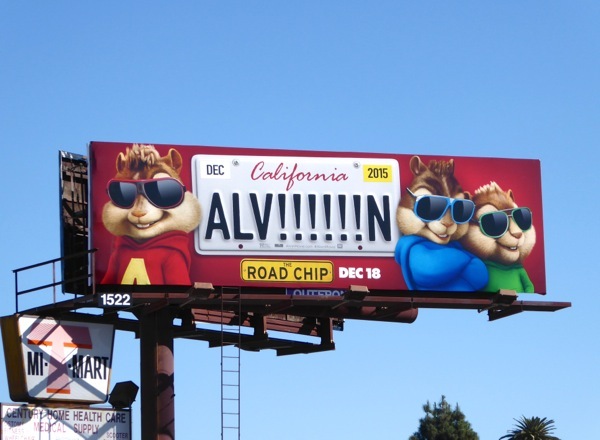 In this fourth movie, through a series of misunderstandings 'Alvin', 'Simon' and 'Theodore' get the wrong impression that their guardian 'Dave Seville' (Jason Lee) is going to leave them after proposing to his new girlfriend, so they arrange a road trip to convince him to not marry her. 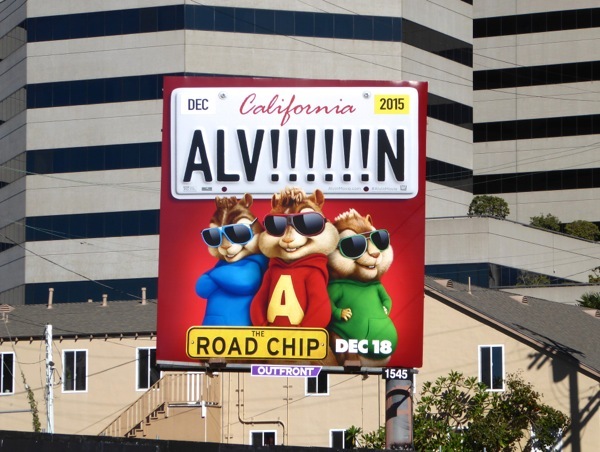 These fun Road Chip movie billboards were spotted along La Cienega Boulevard, Olympic Boulevard and Santa Monica Boulevard on November 29, 2015. 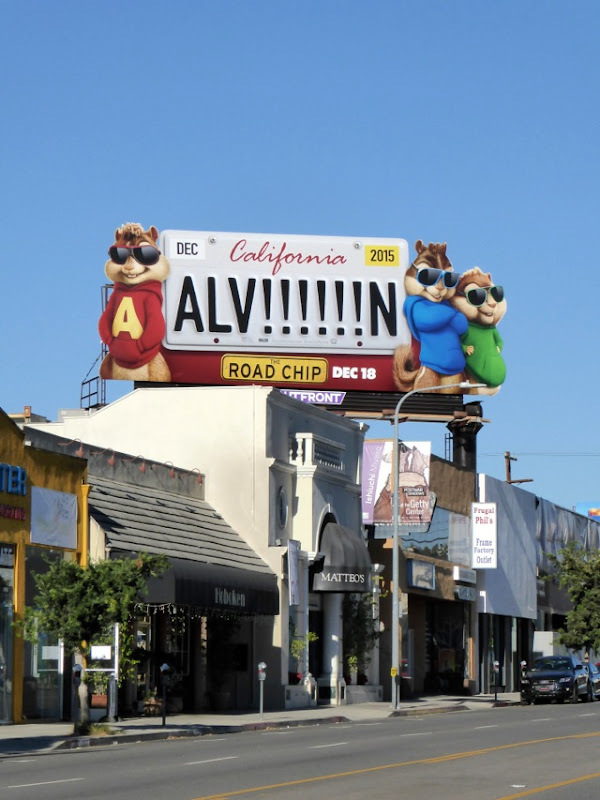 If you're a fan of the computer-animated trio, be sure to also check out these other Alvin and the Chipmunks movie billboards from recent years. 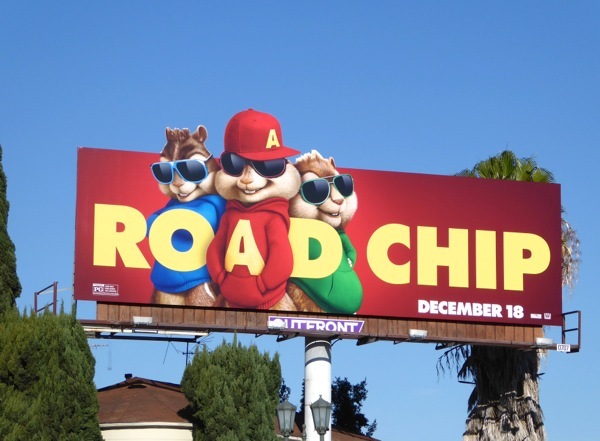 Hang on for a fast and furry-ous ride, which Daily Billboard is sure will end up happily ever after for all concerned (until the next sequel of course, cha-ching). 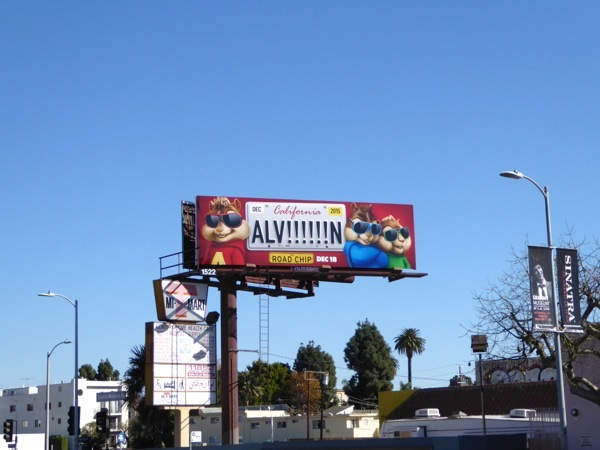 UPDATED: Here's another special extension billboard featuring the fun 'Alv!!!!! 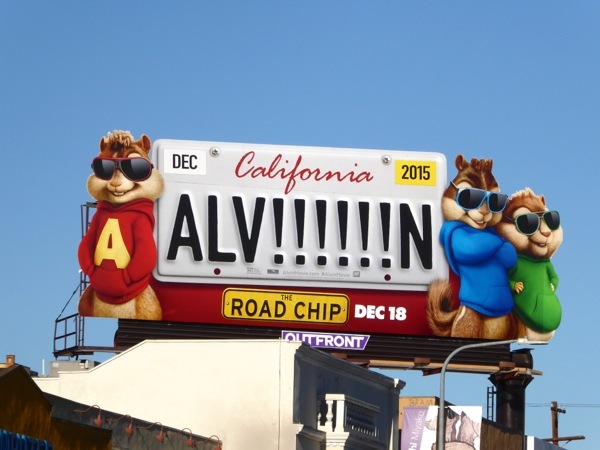 !n' California license plate creative. 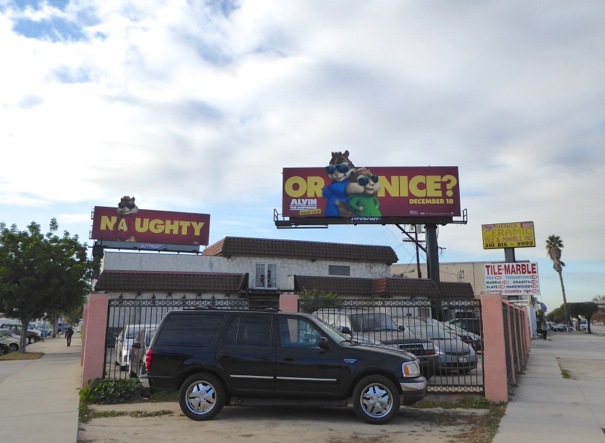 This eye-catching ad was spotted along Westwood Boulevard on December 12, 2015. 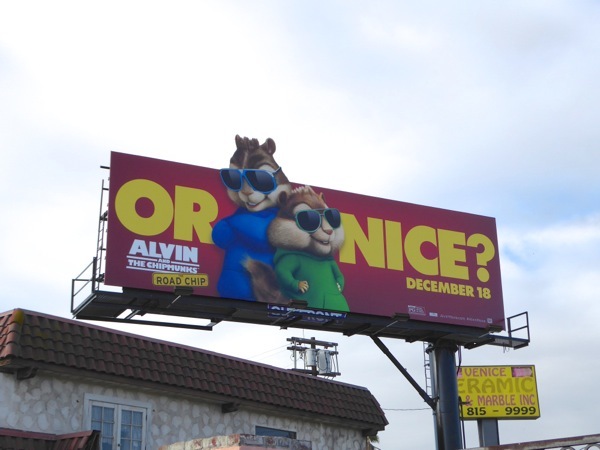 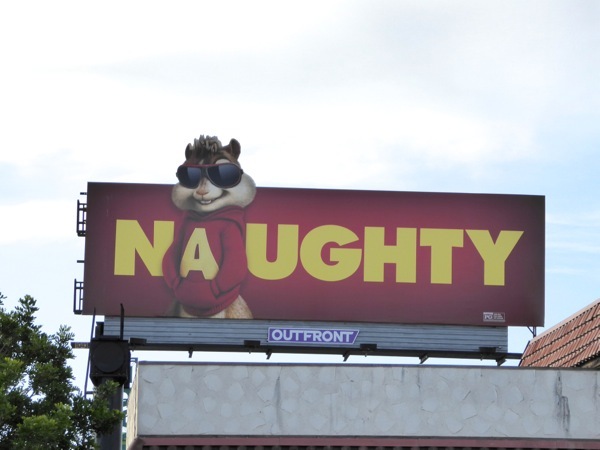 UPDATED: In addition Alvin and the Chipmunks are getting into the holiday spirit with this festive 'naughty or nice' duo of billboards. 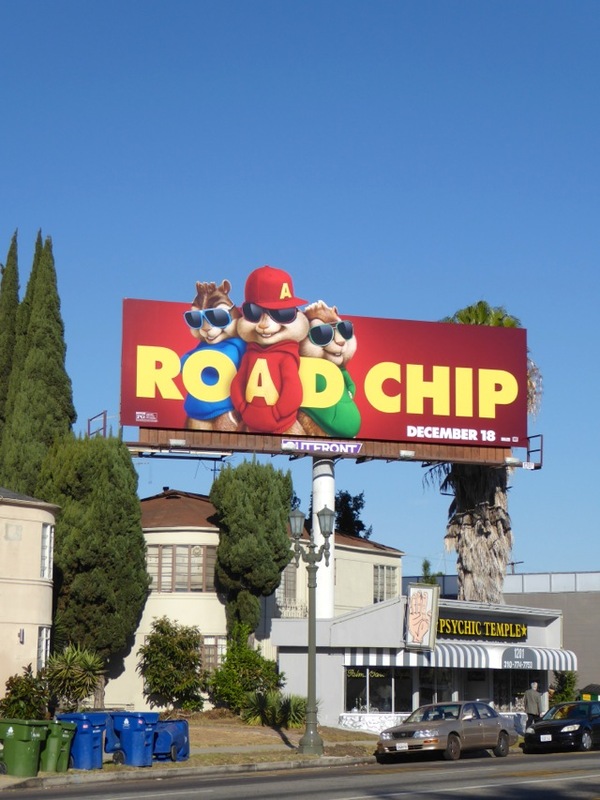 These fun interconnecting billboards for The Road Chip movie were snapped at the busy intersection of La Cienega and Venice Boulevards on December 19, 2015.